Excellent product what was wanted is what was received. As a last minute present i found it easily on the website and found the shipping to be quicker than expected due to the time of year. I would only shop for watches at the watch shop from now on!! Came before due date. Works as expected. What more could one want? Top website. Easy to bust and fast delivery. Im a happy customer. Fantastic watch, light, small, accurate, tough and water resistant, perfect for anything you want to throw at it, these watches have served me well for many years, military, sports and many other tough activities. Fine and dandy reliable, cheap watch that does what it says on the box! This is my second such watch. The first lasted very well for about 8/9 years, but when the strap broke and the battery ran out at the same time, it seemed more economical to just get a new one. The watch does everything that I want it to. Maybe it is a little small for a man but it is excellent value. Bought the watch for my son who is very happy! Thank you! I was overjoyed to find this watch! It is a retro surprise for a loved one who was talking about how much he loved this watch when he was younger. The ordering process, speed of delivery and product quality are superb. I would highly recommend the Watch Shop to anyone. Bought for my son as a present. He is chuffed to bits with it. Great watch , great value. Bought it for my 10 year old and he loves it ! Really good value for money for an active youngster. Only con is its face is quite small so probably not suitable for a 12 child unless they have a small wrist. Exactly what I was looking for. Lightweight and practical. Perfect watch. The strap has been designed with small wrists in mind, which is excellent for people like me! The watch is easy to use, and easy to switch between the different functions of the watch. I especially like the fact that you can do split times while using the stop watch. For example, if your timing someone running around a track and want to see how fast there first lap was without stopping the stopwatch you can do that. This can be useful when running, or competing in other competitions. I have used this watch when surfing, running, climbing, doing press-ups etc.. its very comfortable doesnt get in the way or get caught on anything either, and is water resistant. However, the light button I feel is in the wrong place. It is the top left button which means if you wear it on the left hand, the right hand has to stretch over the watch to press the button, not ideal especially when there is no top right button at all, yet there is a space for one... Another thing, is the fact that when you are taking split times, resetting the stopwatch or setting the alarm is all on the light button doesnt cause any harm though. It looks nice, with a bit of blue and red on the displace panel to add some colour, even looks kind of professional. This watch has been primarily been designed for sporty people, as stated above I have used this in many different circumstances and the watch seems to accommodate all - even water sports! Word of advice, wipe down and rinse of all sweat and salt water after when finished, this will make the strap last much longer. The pictures shown on the website show exactly what it looks like it real life and give and idea to the fact that accommodates wrists of all sizes. Overall, although the light button seems to be in the wrong place when wearing it on the left hand, this is a minor flaw to a watch that seems to suit all physical activities, while still looking good enough to wear casually too. Excellent watch - lightweight and small face makes it feel like its not there. Not too keen on the retro colours on the face - but couldnt find a plain black one of the same model. In fact, this is exactly the same watch I had in the 80s, and on that one the battery only died in 2004!! 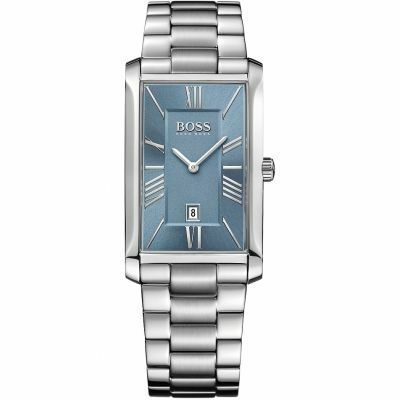 Unfortunately I got rid because I wanted a grown up manly watch, but now Im a grown up and a man liked the price. Having memories of this watch when I was a kid it was the perfect solution for a cheap watch for work whilst letting me relive my childhood. Its exactly as I remember the original. Expect it to be a little bit flimsy are where the straps attach to the face and the LED backlight doesnt shine all the way across the face. Spot on for the money and exactly how I wanted it! Bought this as a gift and they love it - fits great on the wrist and easy to use. Easy to use, very good value and ideal for my daughter who needs a simple watch for all her sporting activities. Product is exactly what I needed . cheap, simple to use, easy to read. It does the jobs most people would want. I fear the battery will outlast the strap, which happened on my last similar watch, but it was a matter of years of use not months !! Only real criticism is that backlight is not very effective - but that might be a problem with my particular watch. Great products and prompt order execution and great next day delivery . Good watch im happy with the purchase, excellent service at Goldsmiths, and prompt delivery. My partner works with chemicals so doesnt like to spend much on a work watch when he knows any strap will be ruined in months. This watch is so easy to set up and the manual isnt needed to do it. Within ten minutes all the alarms were set, the time zones set and he was off to work. Whilst not the most stunning of watches it is plain black so looks absolutely fine, after all if you want stylish you are going to have to spend more. This watch ticks all the boxes if you want something functional. Overall and excellent and affordable watch. I just recently had a one night stand and sadly I left my watch behind. Normally this would be a problem but because this watch is so cheap it does not matter, I will just buy another one! 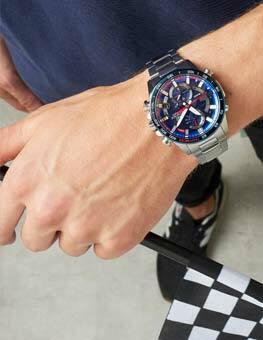 If you are looking for a watch, this is the watch you want to get! Its comfortable, fasionable and is the best watches I have ever had. It will be very good for your everyday needs and you will be happy if you purchase this watch, if you want a watch, get this one !!! This is a black, all plastic, digital wrist watch which, for me at least, has the great advantage of simplicity with almost none of the useless bells and whistles which I know I will never use. It is also pretty much immune to moderate shock and the centrifugal forces which are encountered in golf, for example. No watch of this type has ever failed on me with this kind of abuse. The only downside is the strap which usually fails before the battery the latter is, of course, replaceable. I am a man and an old fogie of 72 if this helps. The Casio is light weight and simple to use, a great starting watch for anyone, or for the purpose i use great for running. its lightweight and easy timing system helps me train for my half and full marathons. its simple design allows ease of use whilst running and due to being water profff is easily cleaned. product is as i expected. very well packaged and a comfortable fit. the price is excellent. exactley what i wanted and was shown on the site. the watch is just fine. 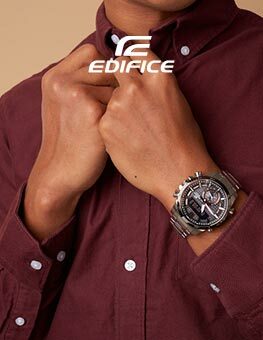 Great for people who would like to have the watch always on their wrist but are afraid of being unconfortable. Basic functions, very easy to be used. I bought this watch for sports and swimming, but its so light and comfortable I end up wearing it all the time. It is small and does not effect the bending of the wrist at all. I wish it had a few more features like a countdown timer. I also wish they made more use of the available size, the bezel around the display is quite thick, they could have almost doubled the size if the screen with out making the overall size any different. Overall, the watch is light and comfy and seems practically indestructible with a serious retro style. I was very pleased with this item, its lightweight and very comfy to wear. The black looks good with most outfits and I like the retro style too. Great little watch, Great little price. Keeps good time, tells me the date and time, Shower and normal swimming safe. just what I need from a watch. There is nothing I dont like about the watch except maybe the strap going stiff and cracking, but it takes a long time. I am very happy with my purchase. its just what I wanted. I am also very impress with the speed the dispatch was. The watch is fine, and a reasonable price. My only criticism is the length of the strap. I have a normal sized wrist, but I have to struggle to get the watchstrap round it. Bought this for when i coach football. comfortable and works great. the stop watch is very useful for competition based drills like who can do an obstacle course the fastest. Positives: Comfortable, Light weight, Easy to use/set up didnt need to read any instructions. Good value for money. The watch is exactly what I wanted for very specific purpose. Cheap, with the date, time and plastic so it did not scratch various delicate bits I was likely to come in contact with. I specifically wanted a stopwatch facility, which has, but it only runs for one hour then it goes back to zero. That is a real nuisance though. Cheap and reliable with many features. Having had these watches before my only reservation is the life of the straps. Excellent value for money if rather more complicated than I should prefer, as I dont foresee using the stopwatch function and for time correction I still need the printed instructions from the Internet, as the print in the leaflet supplied is inconveniently small. I should have preferred a leather strap if available even if at a higher price plastic tends to snap after repeated flexing. This product is very good and very cheap! I use it for outdoor activities and it works great! Its the third or fourth of this type I have owned over the last 25 years, good value for the money. Tells you the time, day and date, what more do you want from a wrist watch! I chose this specific model for 50m water resist, which seems fine for shower and swimming. It is a bit smaller than I expected, significantly smaller than my old timex, which is good as slips under cuffs better. Unlike the timex I could set this up straight away without looking at the manual. This model has the basic light - only visible when you use it in the dark - fine for me. Solid, original and timeless watch. I use it to time my running. Simple as that - love it. Bought for an 8 year old nephew for school as he wanted a no-frills digital watch to help him get to lessons on time. Fits him well and is thinner and smaller than many other watches for boys of his age, which hopefully means hes less likely to bash it into things. He can work all the functions for himself and loves the stopwatch. And as its waterproof he doesnt have to worry about getting it wet. Its not the most modern or sporty looking of watches, which he doesnt mind, but having owned a similar Casio over 30 years ago, I know it should last him for the next 3-5 years at school or until he decides hed like something different. I love this watch because it is not too expensive it is robust, lightweight and waterproof. does exactly what i want it to do. Bought a simple Casio digital watch and it is exactly as described and fine. The service was excellent , the price was very good , extremely competitive, delivery was very quick, the over all experience was perfect. I would recommend buying a watch from this company . I wanted a waterproof digital watch to use when Im cycling,and this watch does everything I need. great product, loving my new time piece. I couldnt be happier. Have loved wearing it everyay, I feel like the bees knees! This watch gets me back to my school days. Time signal on every full hour carved into my memories. So today when I got this watch and when heard the sound at 12:00 my mind was in that classroom again. Also the green back light triggers some moments when we turn of the lights just to see what tie is it. These watches are just excellent value. they are reliable, robust and accurate as well as being cheaper than most watch straps. I am a decorator, and when I get paint on the watch I simply scrub it off in the bath later. I bought this watch as a replacement for a Casio Illuminator which had broken at the strap mounting after many years' wear. It appears that this watch is identical in all but the name. So far it has worked faultlessly, the strap is comfortable with a good range of adjustment and the buttons all work well. It has also kept perfect time to within a second over the 10 days or so since it arrived. I bought this watch for everyday wear and particularly like the clear display which continuously shows seconds with the time, as well as day and date. It's also water resistant enough to keep on while dish washing, car washing etc. and the battery on the previous model outlasted those in all my other more expensive watches.I wear one of the other watches on special occasions but for all other times this, my cheapest watch is also my favourite. I would not hesitate to recommend. super cool watch for an excellent price. Great value and awesome service. Very happy! Fast service - arrived next day. Have had Casio watches for many years - low price, good quality. Alarm, stopwatch (for running) and 24 hour version fit my requirements. Other watches are more expensive and with fewer benefits. Why go elsewhere? Smart watch, specification met exactly. Performs perfectly and has been used constantly since I bought it. No bad points to date, all in working order. Quite a few compliments on the watch as it is so simple and yet still cool to wear both through the day and if you go out for a drink or meal. I was looking for this classic watch and I found it cheapest here. I have really small wrists so was worried about getting the men's watch...as I am female too but it fits perfectly... obviously its is adjustable. I came with the box and warranty, everything you would expect in a shop. Easy to use, intuitive buttons I plan on wearing it while travelling. Unfortunately it says 50m waterproof which I interpreted as 50 meters to my detriment. It is only swim proof apparently, not dive proof. Gorgeous watch, and so well built, just like the Swiss Army Knife. If it'll stand Commando use it will do me. excellent sports watch and good value at the price.Easy to set up. Very light and comfortable strap. 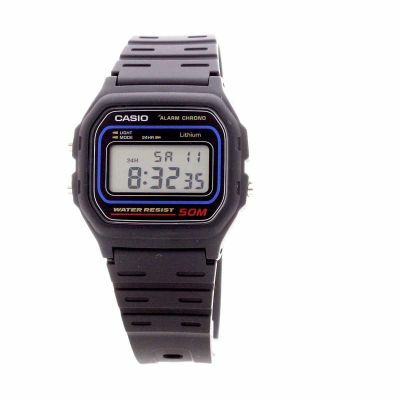 This is one of many similar Casio watches I have purchased largely to wear while I am working/gardening etc as an alternative to other much more expensive watches which would not stand up to the harsher conditions. I particularly like the "light" feature which means I can check the time in bed in the middle of the night; what is not so satisfactory, however, is that the strap does have a tendency to snap albeit not usually until after several years have passed. I will undoubtedly purchase further items in the future. I had one of these before and was "persuaded" to give it to my daughter, so I, naturally, bought another one. I bought this watch for my fiance who likes to go running. It is perfect for sports as it displays digital time and has stopwatch functions. It is also perfect to wear on the weekends when he wants to go casual. It's a really great watch - easy to use, nice-looking and practical. Nothing to fault! Light, with an easy to adjust strap to wear on my small wrist. Mainly non metal construction makes it less prone to scratches when doing gardening or other risky jobs. Water resistant, so no need to remove before using the bathroom. An excellent replacement for a similar model which finally broke after many years of hard use. Good watch. Nice and cheap but does the job of telling the time with a little bit of retro style. 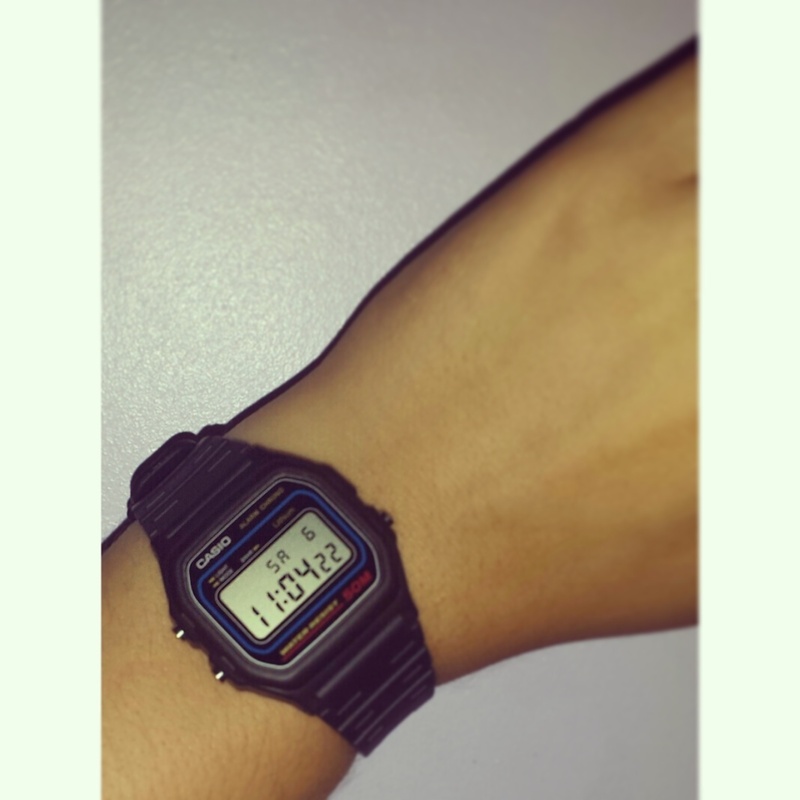 good solid retro casio, unlike alot of watches you forget its on your wrist until you need it. Accurate, waterproof and of no interest to burglars! Perfect watch for today's world. Bit old fashioned looking but cheap and works well for the price. Slim. Lasts a long time. Stopwatch buttons easy to use. Waterproof for swimming. Backlight is a bit dim and hard to read in the dark. Alarm is quiet and may not wake you from a deep sleep. Good basic watch. all the features you need - alarm, 50M waterproof & easy to read and easy to use! Fantastic entry level watch at a very good price. 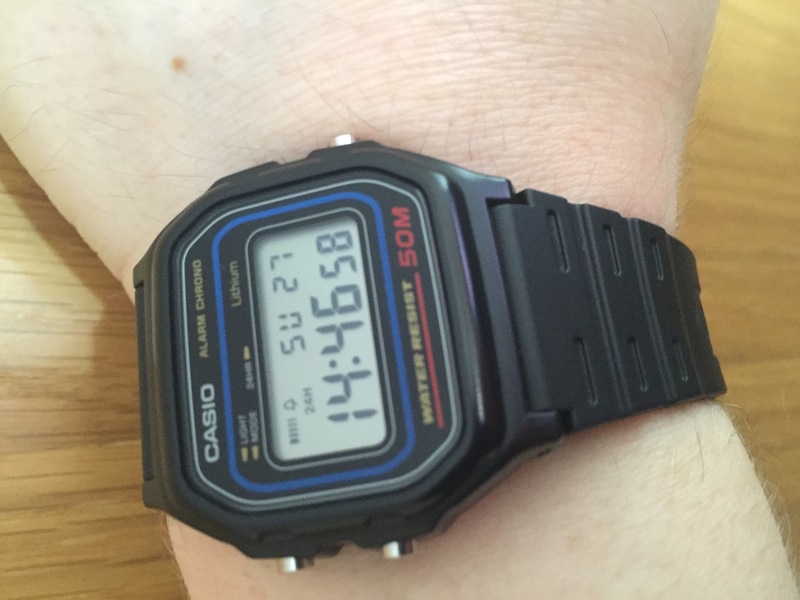 I bought the Mens Casio Retro Chronograph because I'm going on holiday and wanted a multi function watch that didn't cost the earth in case I lose it. This fits the bill perfectly. It has all the functionality I want, ie. Date/Time/Alarm. The controls are a bit fiddly but the watch is robust and does what is advertised. I find the daily repeat alarm a bit unnecessary and turning the alarm off in a dozy state could be easier but for the price - I don't mind. Excellent product with a classic style and durable nature. 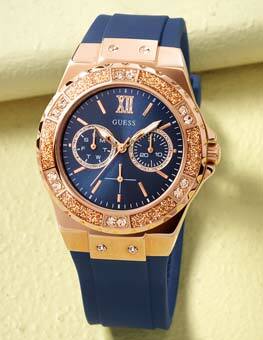 Has all the basic functions required of a watch at a bargain price. My son wanted a new watch and is very pleased with this one. He is 13 years old. Bought this watch for my son. Are accurate. Very light. Indication of a large and easy to read. What we need a little boy. Very nice looking watch. Have used the alarm function already to remind myself about something I had to do. Functions seem very easy to use, thankfully. Bought as a gift for my nephew, I was really impressed with this watch when I received. It was just as I remember the 80's style digitals so had a good retro feel to it, and was so easy to use that I did not need the instructions to operate any of the functions or to set the time and date. The fact that the strap was able to go really small was an advantage as my nephew is 8, and this is much more grown up than the childrens watches available. For the money it is unbelievable value - I'm tempted to get one myself just as a bit of 80s memorabilia. 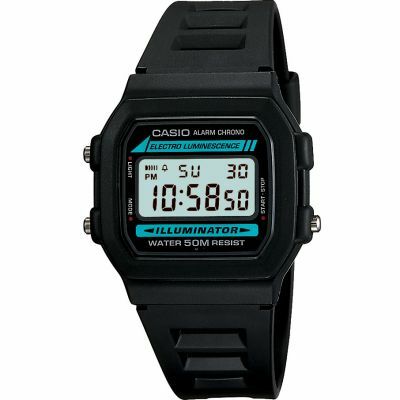 My retro casio watch was just as simple to use as I remembered my original 'Illuminator' was. It has a simple button push between anologue and digital formats and the alarm and date settings are equally easy to make. The watch is small and snug to the wrist and does not catch when doing jobs. Much smaller than i expected. But display is clearly visible at a glance while running. 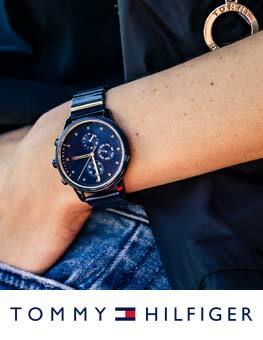 A very light and discreet watch that is well worth the low price. I have always preferred to wear a cheap Casio watch, even though I have an expensive gold watch and several other watches bought or inherited over many years. My previous weatch was about 7 years old and required a new strap and battery. So an online search was made and Watch Shop had what I wanted. Immediate despatch from you and excellent service. I can't imagine how anyone in the chain from manuufacturer actually mage any money!! This is about the sixth identical item I've bought - a Casio waterproof watch - which I wear for sports and swimming. With all the others the strap broke before the watch (usually after two or three years). Great watch, lousy strap! But cheap enough to be worth buying again and again rather than repairing the strap each time. A basic watch that has all the functions needed for everyday use. The alarm is loud enough to use in the morning. The added bonus is it's water resistant to 50m so can be submerged without having to worry. Plus points: cheap, long battery life, loud alarm, waterproof, robust. Minus points: straps tend to break after 12 - 18 months, it's more practical than fashionable. A simple but lightweight and compact watch. Simply works and is cheap enough for you not to have to worry about damaging it when doing jobs. Exactly what I want in a cheap, no frills, simple watch. Nothing unexpected, and everything very accurately described on website. The watch I purchased was for use at the gym where I get very hot and sticky. Therefore I needed a waterprrof watch whic would be reliable. This casio watch is perfect for the job and so far has proved to be exactly what I needed. The confortable rubber strap holds the watch firmly in place but is equally impervious to moisture.